It is time for a new Jesus Movement and Great Awakening! misled by many false and immoral "Pied Pipers" and our borders are still not fully secure, by the grace of God we do now have a new leader, President Trump, who is working on turning our nation around and upholding our national motto "In God we Trust". May this lead to our nation letting Jesus Christ be the light of our nation once again! and die and many to end their own lives in suicide. end to this present ever more violent and increasingly immoral age. READY OR NOT JESUS IS COMING BACK SOON! 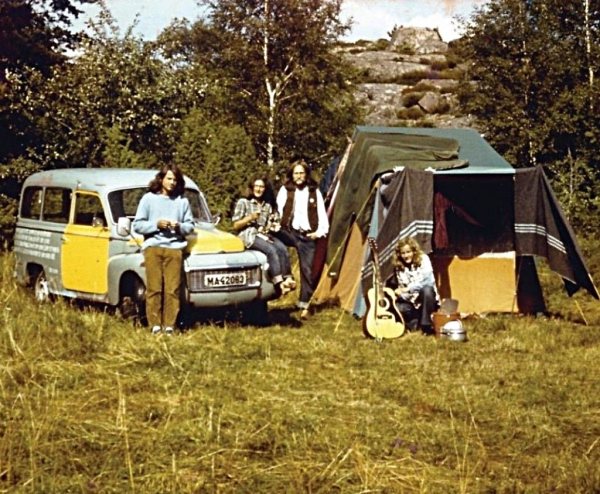 Pictured above are photos of Jesus People in Sweden and Italy in the 1970s. 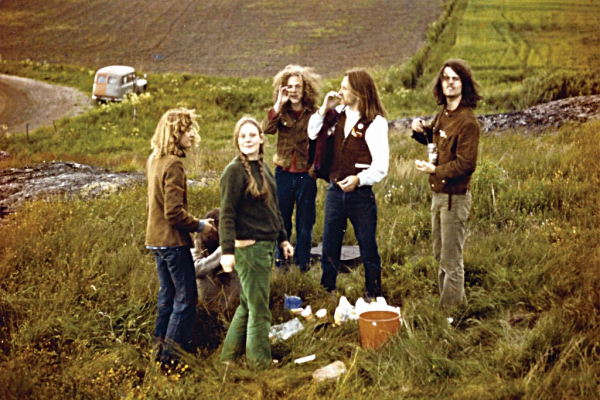 The first and second photos show Swedish Jesus People taking a lunch break and camping on their way to Denmark to evangelize and tell people about Jesus. 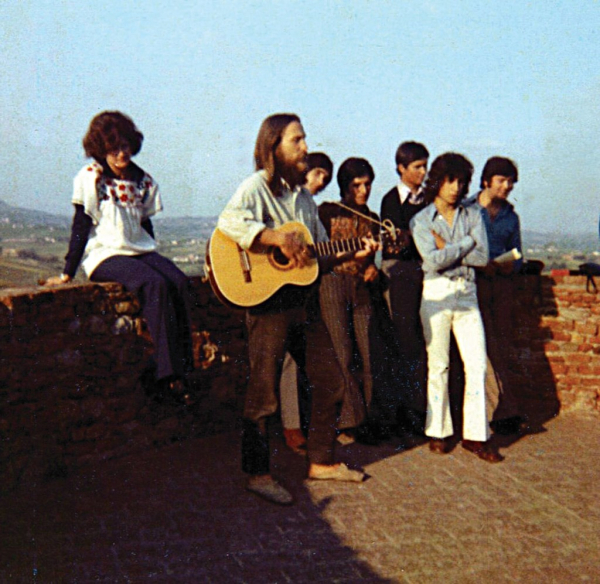 The third photo shows Jesus People evangelizing young Italian people in Tuscany, Italy. Truly the harvest is plenteous, but the laborers are few. 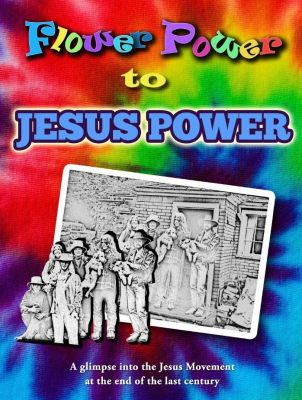 Their story about how God used them to preach the Good News about Jesus Christ, who He is and what He did for them to their friends, their communities and the world is told in the book "Flower Power to Jesus Power". "Flower Power to Jesus Power", Title 1 listed below, is an important book about some of the things that the Lord was doing in the late 1960s and early 1970s, in what became known as the Jesus Movement, in the northwest part of the United States and in Western Europe as witnessed by one of the participants in that Movement, who lived in and visited many Jesus Houses and Christian communities during that time. It tells about how God used new saved Christians, who came out of the Hippy Movement and the drug scene, to reach out to their friends, their families and to their communities and society at large to tell them about how God rescued them from drugs, alcohol abuse, New Age cults and the world to a new life in the Kingdom of God. It tells about how God used new Christians with no theological background, but just with the Power of God's Holy Spirit, to heal the sick and oppressed and to preach the Full Gospel of Jesus Christ to a world that is so desperate for the Love, Joy and Peace that only God can give. The Good News is that Jesus Christ really did rise from the dead and He is still active in the world today and He is still calling for all people to come to Him to receive Eternal Life and citizenship in His Kingdom, the Kingdom of God. 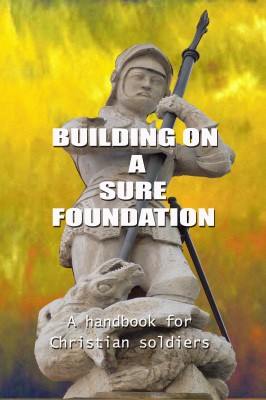 "Building on a Sure Foundation A Handbook for Christian Soldiers", Title 2 listed below, is a Christian Handbook that contains Bible studies for new Christians. It is a compilation of Bible studies used to teach newly saved young people during the days of the Jesus Movement, in the sixties and seventies, who came out of the Hippy Movement. It includes the fundamentals of Christianity and important topics that new Christians need when going out to witness and tell others about Jesus and their Christian faith. It includes teaching on salvation, Baptism in water and in the Holy Spirit, pointers on witnessing, Christian morality and Holy living, God's will, Christian meetings, other religions, and a chapter on Bible Prophecy and the End Time. The three books listed below have recently been published by Xulon Press and are now available directly from the Publisher or through many different book sellers including Amazon.com, Barnesandnoble.com, Walmart.com and many others. They can also be ordered by your favorite book store. TITLE 1. "Flower Power to Jesus Power"
"Flower Power to Jesus Power" is a documentary about a part of the Jesus Movement that occurred in the U.S. and Europe in the late 1960s and early 1970s. It begins in Seattle, Washington during a great outpouring of God's Spirit over many churches and youth in that city, especially those in the Hippy Movement. Today we need a new outpouring of God's Spirit as this present age comes to a close. A Handbook for Christian Soldiers"
"The Handbook for Christian Soldiers" or "Building on a Sure Foundation" is a handbook for Christians, especially new believers, to help them get firmly grounded in the Christian faith. It covers everything from the basics of faith in Jesus to guidance on how to tell others about Jesus to comparison of Christianity with other religions and an excellent discussion on Bible prophecy and the End Times. It is a must have book for every Christian who wants to be well equipped to go out and win souls for Jesus and His Kingdom. TITLE 3. 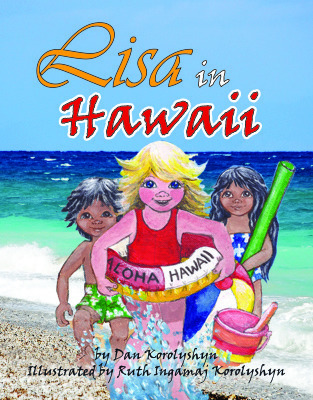 "Lisa in Hawaii"
"Lisa in Hawaii" is a children's book for young children in the three to eight year old age bracket. It tells a story about a young girl that goes on a Hawaiian vacation to the island of Oahu where she meets some Hawaiian children who take her on a trip around the island and show her the natural beauty of Hawaii as well as some important historical sites of their beautiful island. This book contains a short glossary of Hawaiian words that a visitor should become familiar with. It also has the Lord's prayer in the Hawaiian language.